On our final crisp morning in Nova Scotia I drove solo to the Blue Rocks, nearby our stay in Lunenburg, to capture the early morning light. On the previous day Dalene and I had come out to scout the area, and I knew exactly where I wanted to head to. Except that on this morning, a band of fog rolled over the water and the horizon pinks which had started to show only moments before were soon covered by a thick vapor. My perfect photogenic morning had to be altered. Instead of having nice golden light, it would be a fogtography type of shoot.But by now, I knew this to be typical. There was no sense getting upset, and to do so would be short-sighted of me anyways. I had the Blue Rocks all to myself, and I was up for the challenge. I even surprised myself a little, given that after seven intense weeks of touring through Atlantic Canada, I wasn’t instead agitated or tired. I had been up early most every morning, stayed up until midnight on many nights to capture the stars, but I was still as excited to be up before daybreak as I was the first morning. That says a lot about these areas we’ve visited – and Nova Scotia in particular – that my attention was held unbroken for so long. In Nova Scotia alone we drove over 3,000 kms (and only in the southern part of the province). We saw, and did, some pretty unexpected things. From riding the world’s highest tides which turned into crazy rapids and setting foot on some beaches that are best described as I-can’t-believe-it’s-not-the-Caribbean, I am startled to remind myself that we only saw roughly half of the province. The rest, we will surely be back for later, but for now, this is what we got up to along the Evangeline and Lighthouse Trails. That says a lot about these areas we’ve visited – and Nova Scotia in particular – that my attention was held unbroken for so long. The highest tides in the world rushing in is a spectacular phenomenon to witness. And in Maitland, we were able to get on the wave and the natural rapids it creates. We played in them for hours. We were tossed from side-to-side and soaked head-to-toe by the time we were done. We chatted with locals who used to ride these waves in small dinghies before the tour companies arrived and can’t imagine doing so without the knowledge our guide had. It was quite the ride. When we arrived in Nova Scotia, our first few days were plagued by some tough circumstances. 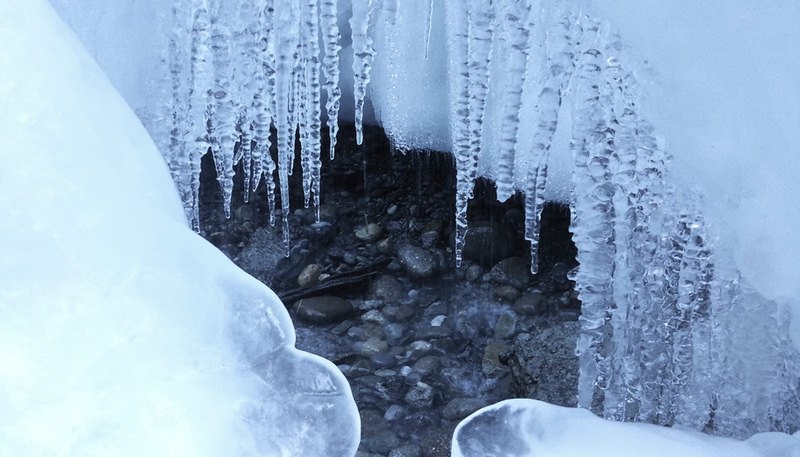 Many of the hikes we wanted to do were unavailable due to trails being completely closed off – fires in other parts of the country had spread resources far to thin to risk another. 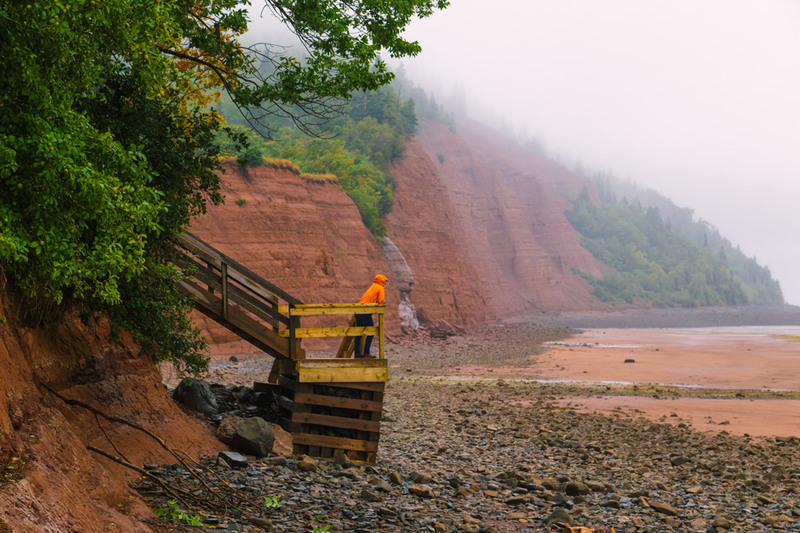 We were forced to bypass the desired Cape Split and couldn’t do all we wanted to at Cape Blomidon, but one stroll on a foggy beach was enough to placate us for awhile. The north and south shores of Nova Scotia are completely different. 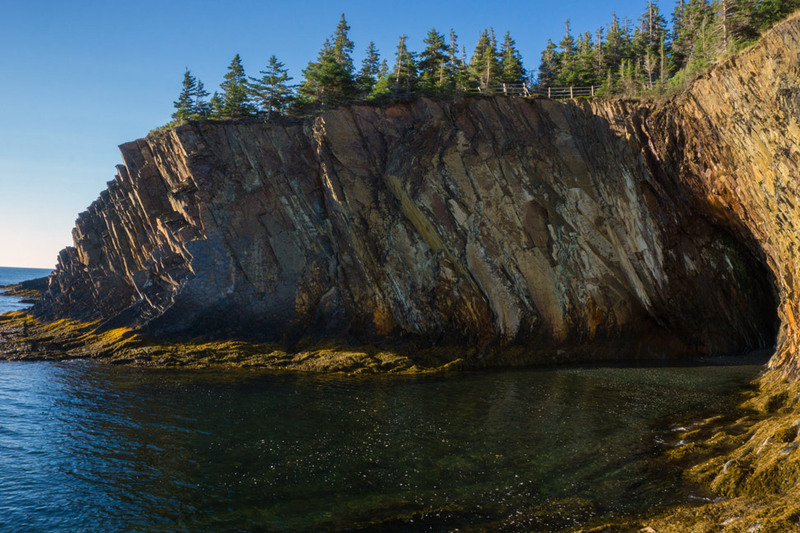 On the north shore with the Bay of Fundy, shorelines are lined with cliffs, red sands and stones, and tides that seem to go in and out for kilometres. Compare that with the south and beaches can be mistaken for some in the Caribbean. 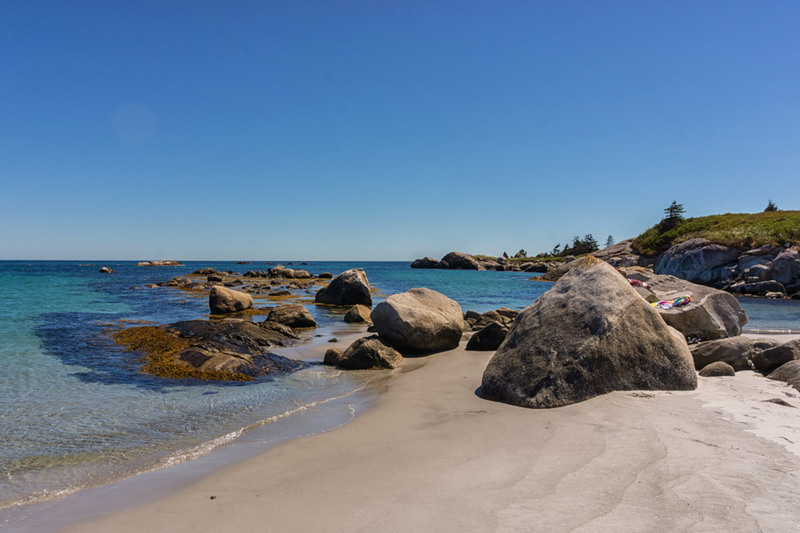 The pure white sand and inviting crystal blue waters are some of the nicest beaches we’ve ever seen (especially in Canada). It’s crazy to think that we’ve never experienced a u-pick farm before. 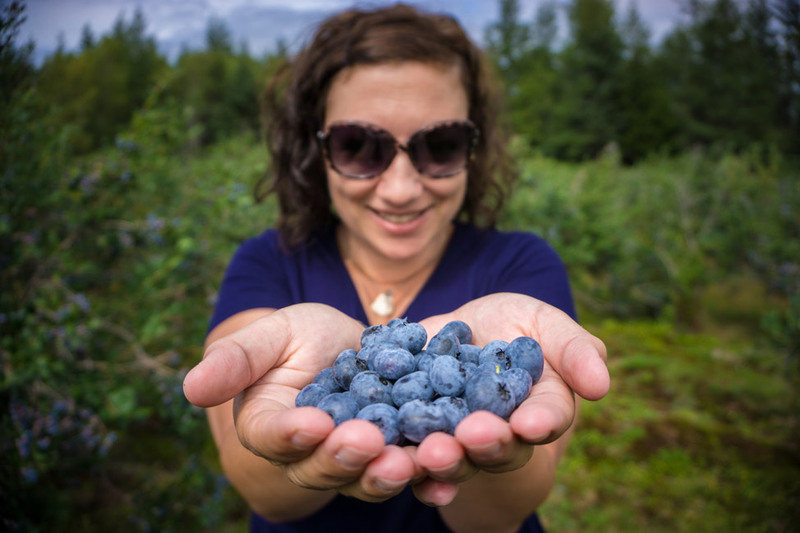 But with so many scattered throughout the southern part of the province, especially in the Annapolis Valley, we couldn’t resist a stop, and decided to work for our own fresh blueberries. We ended up getting 3 pounds of the biggest, juiciest berries we have ever tasted and all for less than $5. This national park has two locations. 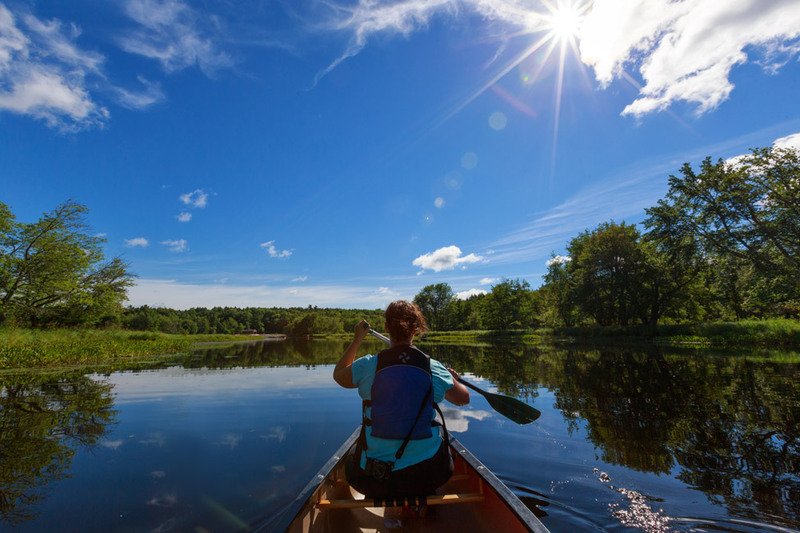 In the interior is a lake and river system that was once navigated by the Mi’kmaw. One of our days was spent navigating from island to island on the glass like water via canoe, spotting the remote campsites we would have liked to pull in to and spend a couple of days! 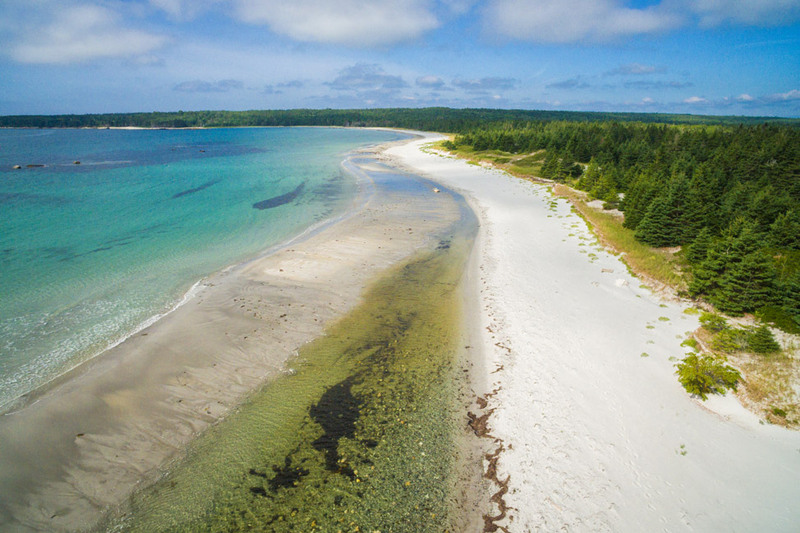 And on the south coast there is Kejimkujik National Park Seaside. It’s all granite stones, white sand beaches and crystal clear water which can be a perfect place to wile a day away. 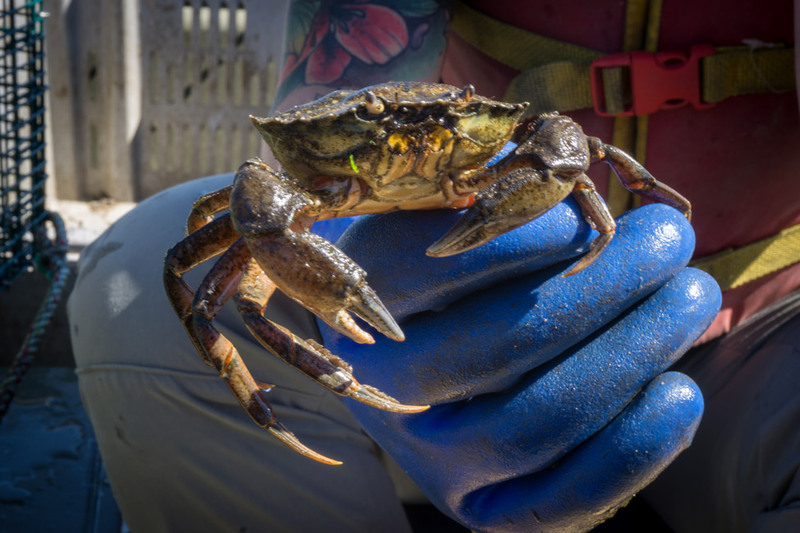 Although lurking in some corners are an invasive species of European green crab brought over on ships during the last century. This type of crab is destroying the ecosystem and we joined the Parks Canada team to clear traps of them. It was a thoroughly interesting afternoon to participate in the excursion, especially to learn of the marked betterment of the ecosystem. 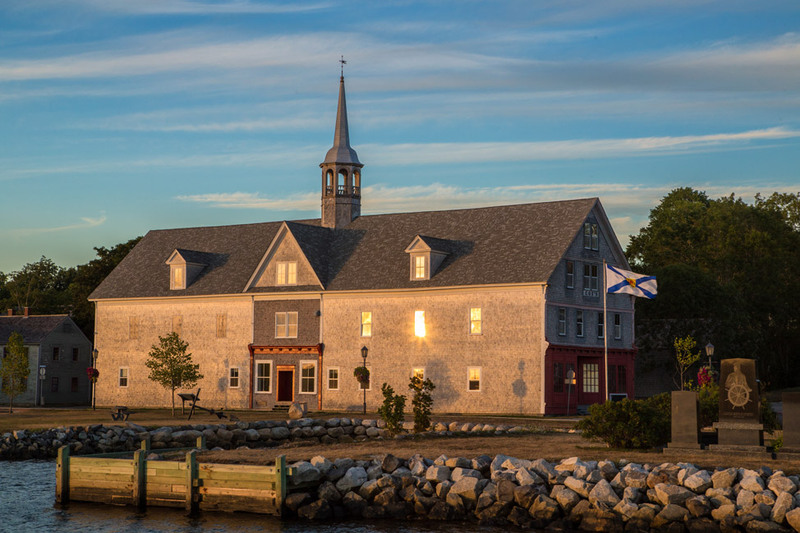 British flags fly freely in Shelburne – a picturesque small city on the southwest shore founded by Loyalists during the American Revolution. We enjoyed Shelburne for strolls in the historic centre, its sunset cruise that mixed history with fresh lobster (perfect combo), and a visit to the Black Loyalist Heritage Center which vividly illustrates the history of those African Americans who were promised land and a new life for taking up arms for the Loyalists, only to be largely deceived. Many departed for Sierra Leone, but others stayed to build their lives in the province. 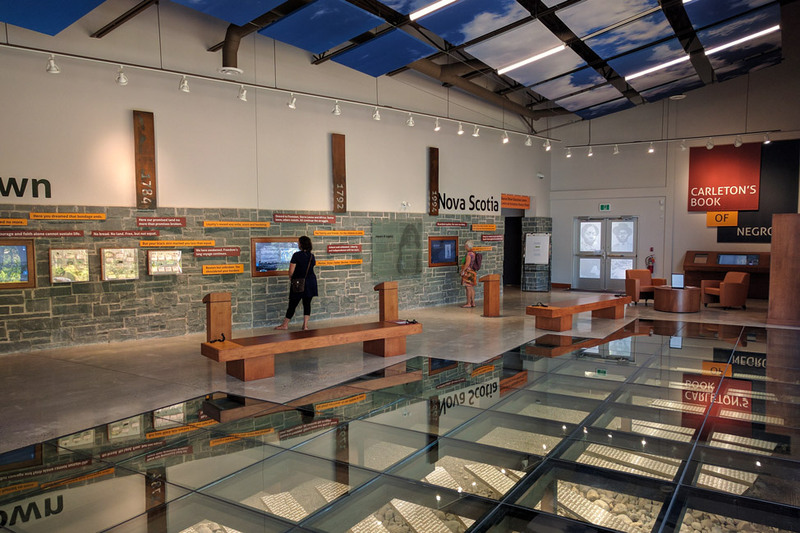 Their journey is an important part of Nova Scotia and Canada’s history, and a stop at the centre is highly encouraged. 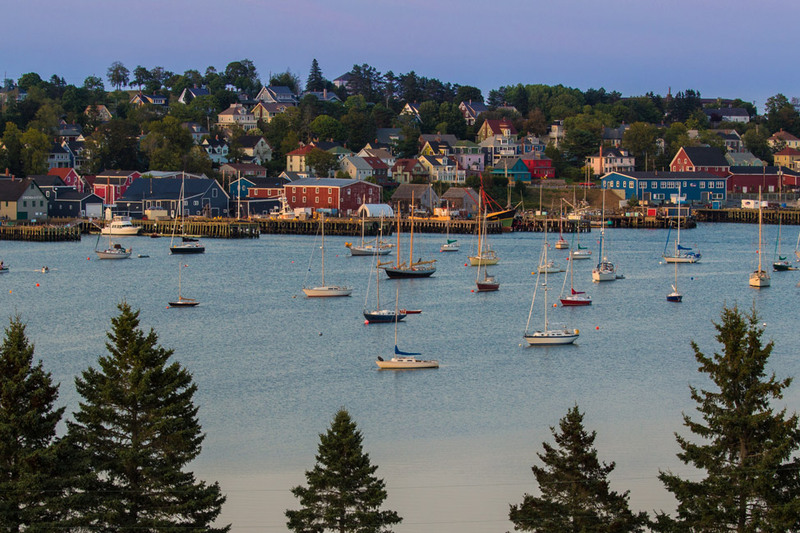 We had plenty to see and do in and around Lunenburg – this UNESCO city is easy to photograph with its colourful buildings and historic harbour and waterfront. Outside of Lunenburg the neighbouring communities of Mahone Bay, Blue Rocks, and many other little inlets give way to plenty of photographs. 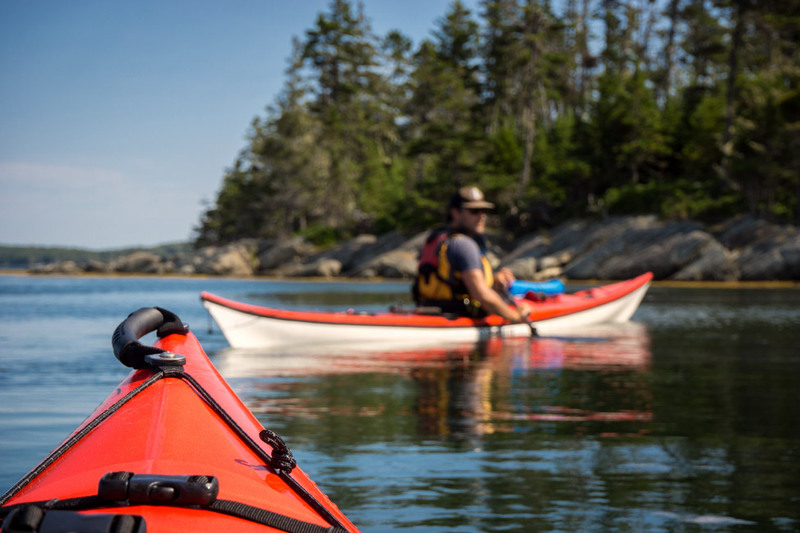 And we caught the ferry over to Lahave in order to kayak to a few of the many surrounding islands, and complete with several seal sightings near our boats. 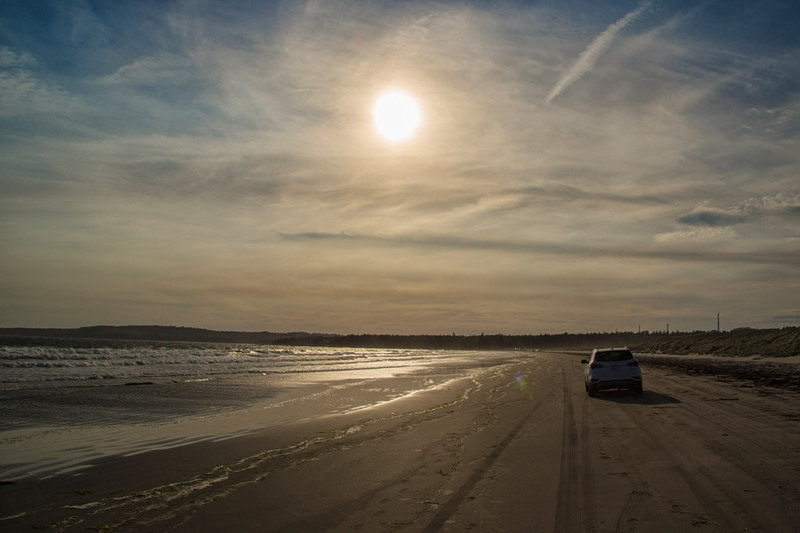 We even managed to drive down Crescent Beach – literally – as it is the one beach in Nova Scotia you can drive your vehicle on from one end to the other. Our few days here easily could have stretched to a week with still more to do. 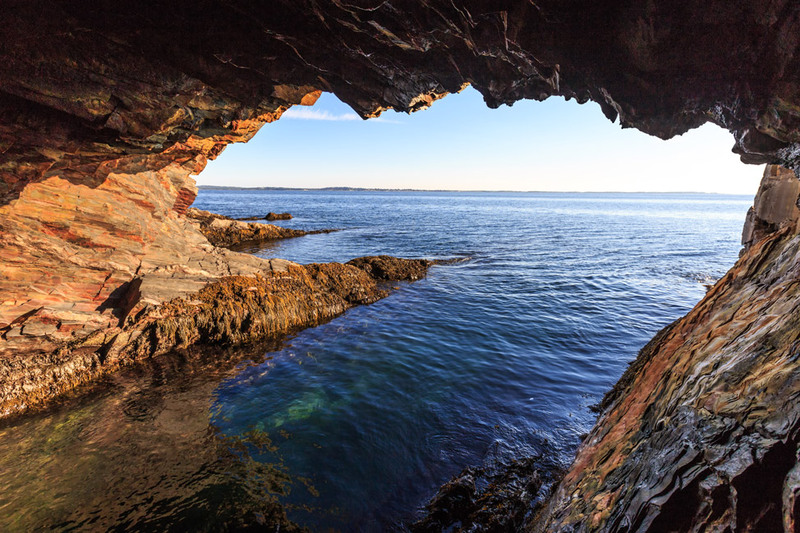 Nearby Lunenburg, through a campsite and down a coastal path, we popped our heads into some amazing caves that have been carved out by the pounding waves. We arrived first thing in the morning and shared the path with only a few others. Next time: we’re going to get on some kayaks in there! 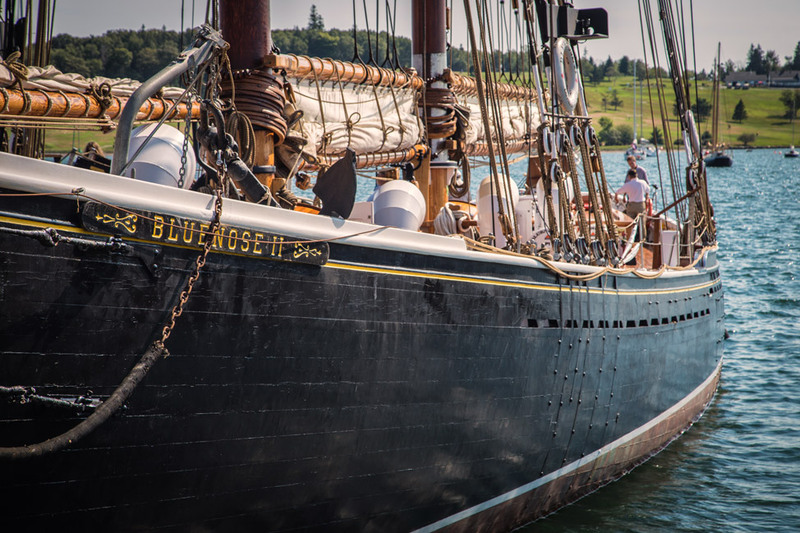 Lumberjacking and sailing through the Tusket Islands were two of our most anticipated stops on our itinerary, and they lived up everything we expected (and more). Full stories on those coming soon. Gorgeous scenery. The rafting looks like lots of fun too. 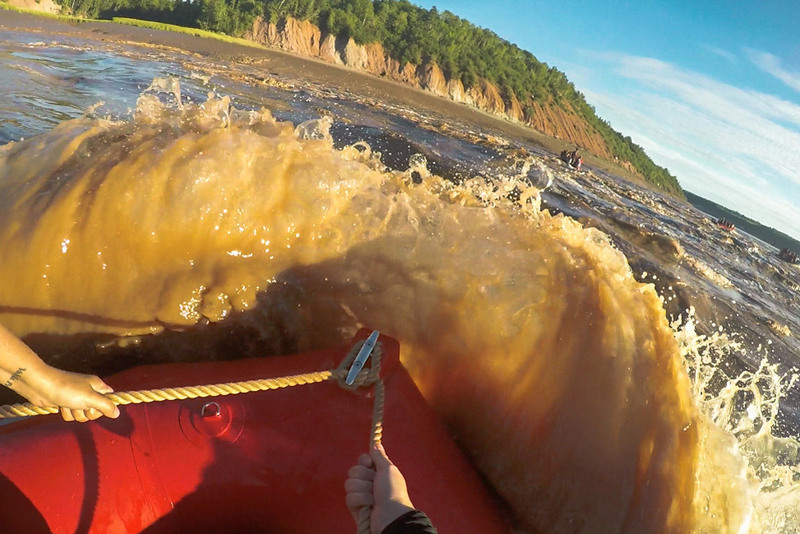 Looks beautiful – and the tidal bore rafting looks so fun! Definitely going on my “next time” list! 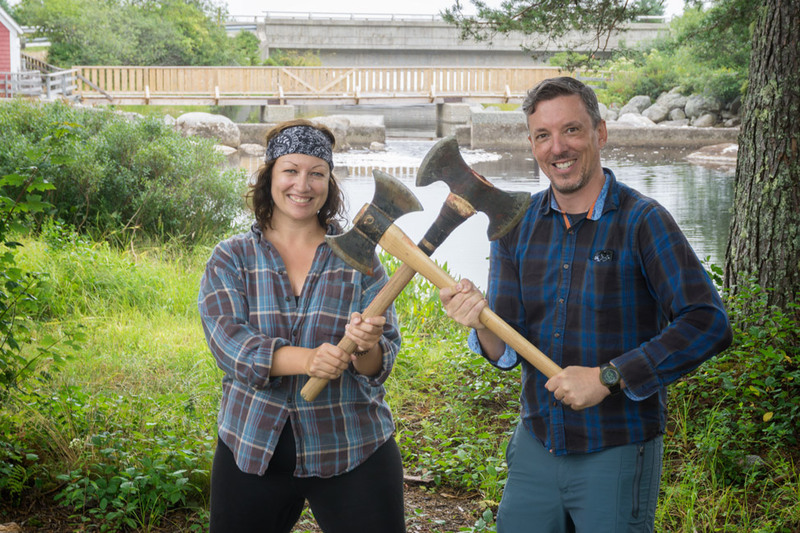 Sad that your Nova Scotia coverage is winding down, but can’t wait to see where you go next! I’ve been hoping to go to Nova Scotia this fall as part of an East Coast US road trip and this makes me want to go even more! The parks and hiking and beaches all look so inviting! Love your photos! 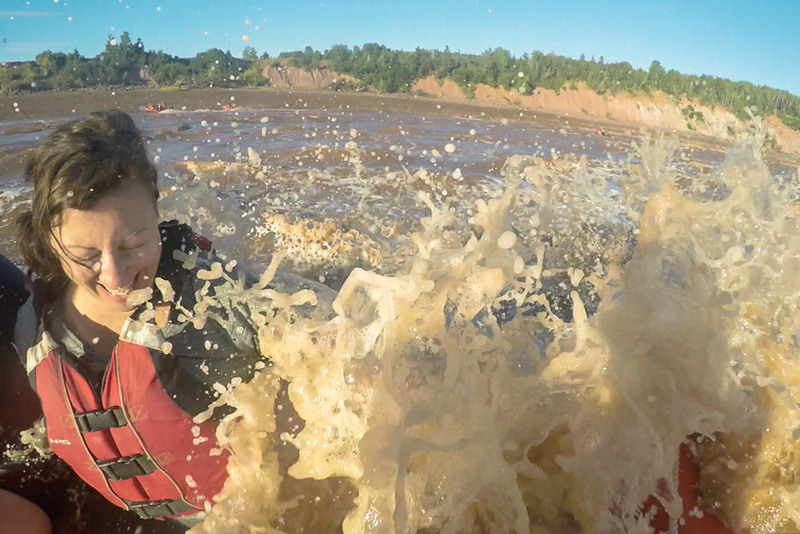 I’ve always wanted to do the tidal bore rafting – I think this is the year. 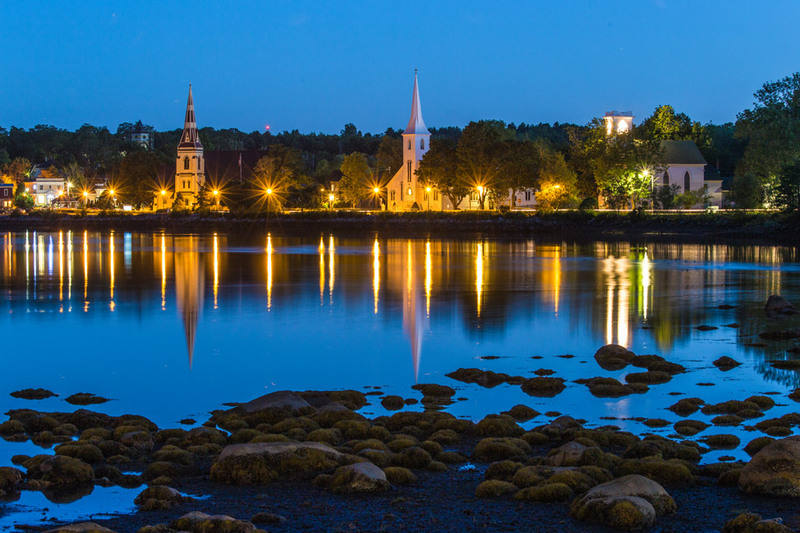 What a great snapshot of Nova Scotia. 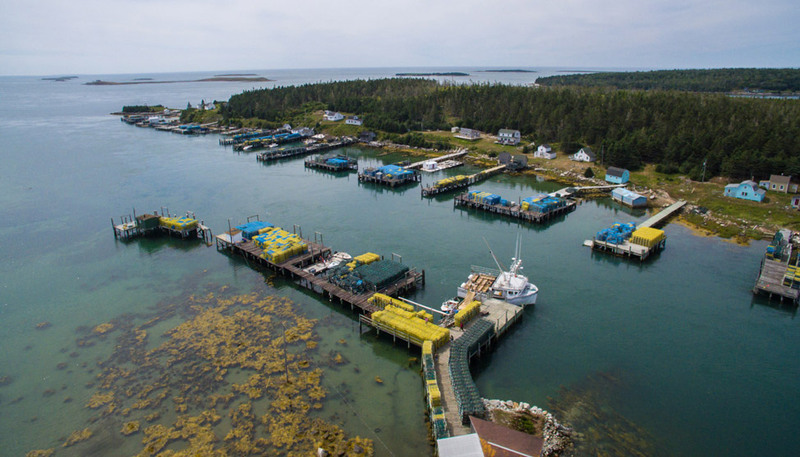 Terrific photos of my home province. In fact, The Ovens and their Ole Miner Diner is our summer evening hangout with live music six nights a week. We live just around the corner on Sand dollar Beach, Rose Bay. Thanks for sharing this snippet of what it’s like to hang out in our little slice of heaven. Great summary!! 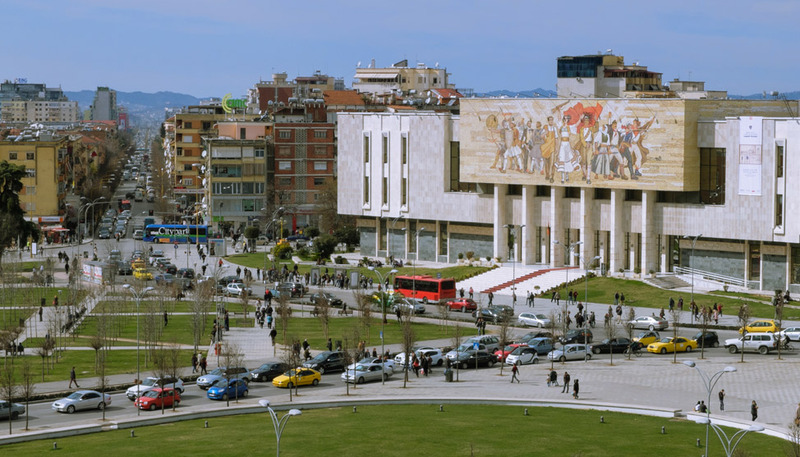 Planning a trip now and found a few new ideas so thank you for sharing.